Steve Carell is reuniting with The Office creator Greg Daniels for a new Netflix comedy series based on President Trump’s proposed Space Force. The series is described as a workplace comedy centered around the individuals tasked with turning Trump’s dream into a reality. There’s only one problem; as an accompanying teaser trailer notes, their mission is rather unclear. “The goal of the new branch is to ‘defend satellites from attack’ and ‘perform other space-related tasks’…or something. This is the story of the men and women who have to figure it out.” Carell himself will star in Space Force, marking his first role as a series regular since wrapping The Office in 2011. According to The Hollywood Reporter, he’s set to earn a record-setting $1 million per episode. ARIANA GRANDE ACABA DE SER NOMBRADA LA MUJER DEL AÑO! El 2018 ha sido un año de altibajos para Ariana Grande, donde terminó su ruptura con el que sería su prometido Pete Davidson y vivió una de las más fuertes pérdidas en su vida, el fallecimiento de su ex novio Mac Miller. Sin embargo, y a pesar de todo, su carrera musical va mejor que nunca, es por eso que la revista Billboard la reconoció como la mujer del año. Ariana Grande, reconocida por ser una gran cantante, compositora, actriz y activista logró con su más reciente álbum Sweetener lo que miles de estrellas luchan por alcanzar; permanecer por más semanas en el puesto número uno en la lista Billboard, y Ari lo logró no sólo con un éxito, si no con dos, God is a Woman y No Tears Left to Cry. De esta forma, Ariana Grande se une a la lista de mujeres destacadas en la industria musical que han logrado tan prestigiado reconocimiento, entre las que se encuentran Lady Gaga, Selena Gomez, Taylor Swift y Madonna. Y será el próximo 6 de diciembre que se lleve a cabo una ceremonia y premiación Women in Music en Nueva York, donde Ariana recibirá su bien merecido premio, con alfombra roja, invitados de lujo y todo tipo de presentaciones. Más allá de la música, Ariana Grande utiliza su influencia y redes sociales para incentivar distintas campañas que ayudan a la sociedad, como el March of Our Lives, que pretende regular el uso de armas a nivel mundial, esto después del atentado que se sufrió en Manchester durante un concierto de la cantante. También siempre muestra su apoyo a la comunidad LGBTQ,y todo lo anterior sumado fue lo que la llevó a ser la nueva imagen de Women in Music de Billboard. 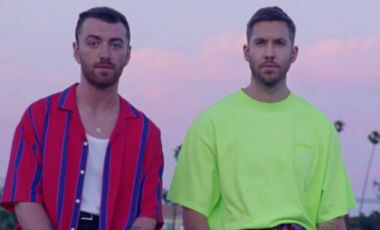 Como se había previsto durante toda la semana, Calvin Harris alcanza un nuevo número 1 en las islas británicas en la tercera semana de vida de su nuevo single ‘Promises’, en este caso junto a Sam Smith. El tema ha vendido lo equivalente a 61.813 unidades durante la última semana, proviniendo la mayoría de los puntos de su streaming, pues es top 1 en Spotify en este país. Se trata del 10º top 1 en las islas para Calvin Harris, siendo solo superado en el siglo XXI por Westlife. Las otras canciones que han sido número 1 de Calvin Harris en el que es su país son ‘Dance Wiv Me’, ’I’m Not Alone’, ‘We Found Love’, ’Sweet Nothing’, ‘Under Control’, ‘Summer’, ‘Blame’, ‘Feels’ y ‘One Kiss’. Además, hay que mencionar los numerosísimos hits que se le han quedado en el top 2: ‘Feel So Close’, ‘Let’s Go’, ‘We’ll Be Coming Back’, ‘How Deep Is Your Love’ y ‘This Is What You Came For’. Curiosamente, yéndonos a la lista de álbumes, también es el 10º top 1 para el artista que lo ocupa, Eminem. ‘Kamikaze’, disco lanzado el pasado viernes por sorpresa, ha vendido lo equivalente a 55.115 unidades en siete días. De los 10 discos de estudio de Eminem, los 8 últimos han sido top 1 en Reino Unido, y también lo han logrado la banda sonora de ‘8 Mile’ y ‘Curtain Call: The Hits’ (también un álbum de D12 que hay debate sobre si cuenta o no). Another source shared with E! News that Ben was doing well for the last few months and very committed to his sobriety. But recently, he started to slip up and began drinking again. On Wednesday evening, Jennifer Garner was spotted driving her soon-to-be ex-husband to an undisclosed rehab facility. We’re told Ben was not resistant to getting help and reached out for assistance. As for Jennifer, she wanted to be there for him and show support.The Hollywood actor has long struggled with alcohol addiction and previously completed a rehab stint in March 2017. At the time, Ben spoke out about his struggles in a Facebook post to his fans and followers. Although involved parties have claimed that the recordings were faked since they were first released in 2010, the court hearing stems from a 2014 class-action lawsuit brought by a fan, Vera Serova, against Sony Music; John Branca, a co-executor of the estate; MJJ Productions; Edward Cascia and James Porte, the songwriter/producers of the songs in question; and their production companies. According to the lawsuit, in November 2010 Sony stated “We have complete confidence in the results of our extensive research as well as the accounts of those who were in the studio with Michael that the vocals on the new album are his own.” Howard Weitzman, an attorney for Jackson’s estate, released a statement citing multiple engineers, musicians, vocal directors, executives and musicologists as concluding that the vocals were Jackson’s. Sony and the Jackson estate sought to throw the lawsuit based on California’s anti-SLAPP statute, which protects speech on matters of public interest. The trial court judge denied the motion, prompting Sony and the estate to appeal. The argument was heard Tuesday by a three-judge panel of the 2nd District Court of Appeal. Whether or not the vocals are indeed Jackson’s was not the purpose of Tuesday’s hearing, but rather whether the album’s liner notes are protected by the First Amendment. “When you review the motion on appeal, you assume that everything in the complaint is true,” said Bryan Freedman, who represents other defendants in the case. “Any admission that was made was for purposes of that argument only.” A ruling on the anti-SLAPP motion is due within the next 90 days. Among other issues, the 2014 lawsuit raises the question of whether people who purchased the album or songs “are entitled to a refund, in whole or in part, of the purchase price of the album ‘Michael’ and/or the songs. According to sources close to the situation, individuals who attended Tuesday’s court hearing seized upon a statement by an attorney for Jackson’s estate in which he said something to the effect of “even if the vocals weren’t Jackson’s” as proof that they were indeed faked. The sources insist that the attorney was speaking speculatively. The wording of that statement is striking in light of Modabber’s comment, which says Jackson sang “on” the songs, which could be interpreted to mean that his vocals were enhanced or even completed by another singer. Fans have long claimed that an American singer named Jason Malachi actually sang the three songs in question, and he purportedly admitted as much in a 2011 Facebook post, according to TMZ, although his manager later denied it, claiming the post was faked. U2 unleashes its fourth No. 1 and first in 17 years on Billboard‘s Dance Club Songs chart, as «Love Is Bigger Than Anything in Its Way» rises 2-1 (on the list dated July 28). The track from 2017’s Songs of Experience, which bowed as the band’s eighth No. 1 on the Billboard 200 albums chart dated Dec. 23, was remixed by Cheat Codes, Will Clarke, and Funk Hunters, among a host of others. U2’s The Edge tells Billboard, «One of my favorite things is to hear how our songs get reinterpreted by our club remix collaborators. It’s an even bigger thrill to find out that so many people like the ‘Love Is Bigger’ remixes. U2 had last led Dance Club Songs on Feb. 3, 2001, with «Beautiful Day.» The track became U2’s third total and consecutive No. 1, following «Discotheque» (March 22 and 29, 1997) and «Lemon» (Dec. 11, 1993). In June, «Love» became the Irish act’s sixth Dance Club Songs top 10. U2 had last appeared on the chart in 2009, when «Magnificent» hit No. 2 that July. The Rock and Roll Hall of Famers have totaled 12 Dance Club Songs entries, a run which began 37 years ago on the then-named Disco Top 100 with «I Will Follow» (No. 34, May 1981). Thanks to the excitement generated by the ABBA-inspired film Mamma Mia! Here We Go Again, all things ABBA are on the rise on Billboard’s charts. The Billboard 200 chart ranks the most popular albums of the week in the U.S. based on multi-metric consumption as measured in equivalent album units. Units are comprised of traditional album sales, track equivalent albums (TEA) and streaming equivalent albums (SEA). Elsewhere on the Billboard 200, the first Mamma Mia! movie soundtrack re-enters the list at No. 89 with 8,000 units (up 79 percent), of which 5,000 were in album sales (up 123 percent). The album spent one week at No. 1 on the Aug. 23, 2008-dated chart, and has sold 2.1 million copies. Meanwhile, ABBA’s best-of collection, Gold — Greatest Hits, zooms from No. 141 to No. 86 with 8,000 units (up 41 percent), and 5,000 in album sales (up 50 percent). Further, the act’s on-demand streams (audio and video combined) climbed 20 percent to 7.6 million. As Scorpion debuts at No. 1 on the Top Rap Albums chart (dated July 14), Drake scores his eighth leader, matching The Game for the most No. 1s on the list since the chart began in 2004. Scorpion arrives with 732,000 equivalent album units earned in the week ending July 5, according to Nielsen Music, and concurrently opens at No. 1 on the Billboard 200 and Top R&B/Hip-Hop Albums chart. The set is, likewise, the superstar’s eighth No. 1 set on each chart. The album also smashes the record for the biggest single-week streaming total by any title, thanks to 745.9 million on-demand audio streams for its songs in the week ending July 5. Drake has topped all three charts with all eight of his full-length albums; his only set to miss the top slot was his debut EP, So Far Gone, which halted at No. 2 on Top Rap Albums, No. 3 on Top R&B/Hip-Hop Albums and No. 6 on the Billboard 200. Lucky Seven: Scorpion’s arrival also prompts seven Drake tunes to occupy space in the top 10 on the Hot R&B/Hip-Hop Songs chart, surpassing Post Malone’s previous record of six simultaneous top 10s set on May 12. “Nice For What” leads the pack as it rebounds 5-1 for an eighth total week in charge. Former 11-week champ “God’s Plan” ascends 7-4, while “I’m Upset” jolts 16-6. Four debuts round out the cluster: “Nonstop” (No. 2), “In My Feelings” (No. 5), “Emotionless” (No. 7) and “Don’t Matter to Me,” featuring Michael Jackson (No. 8). The new entrances up Drake’s career total to 68 top 10s on Hot R&B/Hip-Hop Songs, padding his record among all artists since the ranking began in 1958. James Brown is second, with 57. Further, with all 25 Scorpion tunes and a collaboration with Lil Baby – “Yes Indeed,” present on Hot R&B/Hip-Hop Songs, Drake rewrites his own record for the most concurrent hits on the chart. His current mark of 26 eclipses his previous best of 24, achieved on April 8, 2017. Even More Records: Drake’s record-setting week also extends to the Hot Rap Songs chart, where he also lands seven simultaneous tracks in the top 10. The collection outdoes the six at once first earned by Post Malone on May 12, which Drake later matched on June 9. Likewise, Drake places a record 17 tracks on the 25-position Hot Rap Songs chart at once, passing his prior all-time best mark of 15 from May 21, 2016. Not Just Rap: Scorpion, with its mix of rap and R&B offerings, also helps Drake make history on the Hot R&B Songs chart. The album prompts seven debuts in the chart’s top 10, tying for the most simultaneous hits in the region since the chart began in 2012. The Weeknd also landed seven top 10s at the same time, on the chart dated Dec. 17, 2016. Ariana Grande’s new release “God Is A Woman” is generating a kind of religious experience for her fans, many of whom took to social media to share their first thoughts. It seems Arianators’ prayers came true. The single, lifted from the forthcoming album Sweetener, came out a full week ahead of schedule. And its everything right now for her followers. «God Is A Woman» immediately began trending on Twitter as fans dived in. Some freaked out about its final epic moments. Check out some of the best memes and reactions below. #godisawomantonight just glorious!! The beat, the voice, the experience!!! It’s a masterpiece! !